If you walk by Pennsylvania Academy of the Fine Arts' Hamilton Building this week, you’ll be greeted by a colorful new surprise. 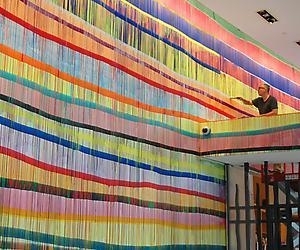 The legendary fine arts institution has commissioned German-born, New York-based contemporary artist Markus Linnenbrink to create a 118-foot vibrant masterpiece in the entrance hall. He is well known for his abstract, layered, colorful works. With the help of three PAFA students, the new piece is a welcoming addition to the building and is something that can be seen from Broad Street. "The museum decided to change the lobby because it looked corporate. They wanted to signal to the outside world that this where things happen in terms of art," Linnenbrink told AL DÍA. The new mural, which is set for completion at the end of this week (Jun. 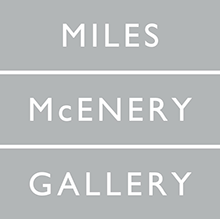 26), will remain a permanent PAFA fixture.